Thank you, STAR FINE FOODS, for sponsoring this post! All opinions are always 100% my own. 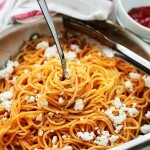 Garlic Pasta with Ketchup and Feta – Easy, 30-minute garlic pasta served with ketchup and crumbled feta cheese. Ketchup?! IN PASTA? WTH?!? I know, I know. WAIT! DON’T RUN! I swear, this is VERY gooooood! I GREW UP ON IT! Please don’t go! But, first and foremost, HI HI! Happy Sunday! How are you?! How was your 4th? I am still hearing fireworks. My ears are ringing, my head is, too, but mah belly is full and happy! Me like grilled food, a lot! Second? 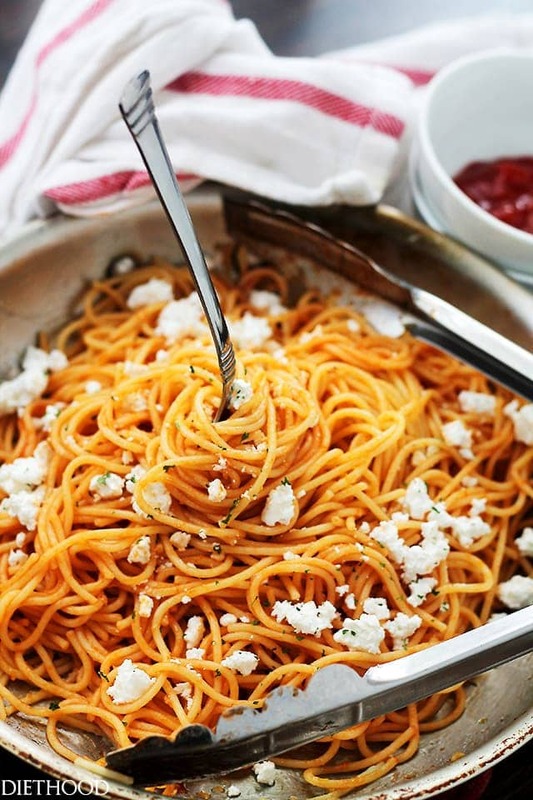 Ketchup and feta cheese over spaghetti is one of my favorite childhood meals! 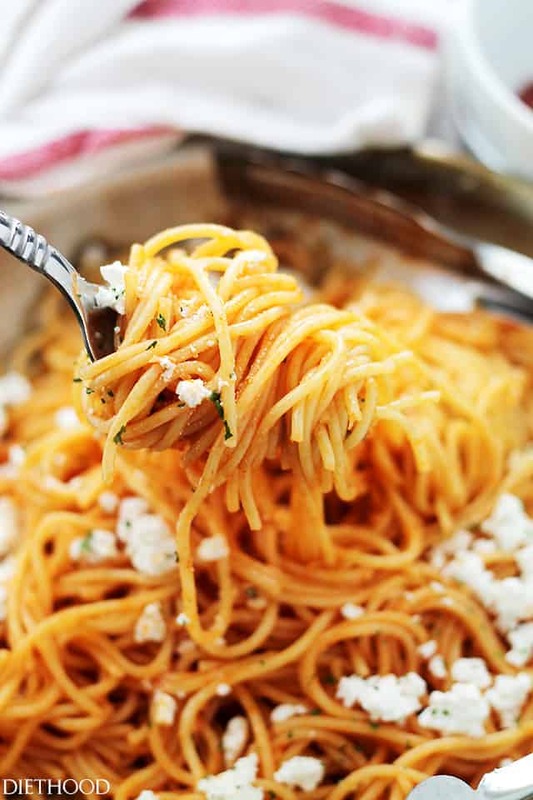 THIS is what we call, Macedonian-style spaghetti. Growing up, my mom and grandma used to make pasta from scratch, without the KitchenAid attachments and the fancy drying machines. The process seemed forever long, and I remember the noodles drying on clothes hangers, or over wire racks, even over the backs of chairs. 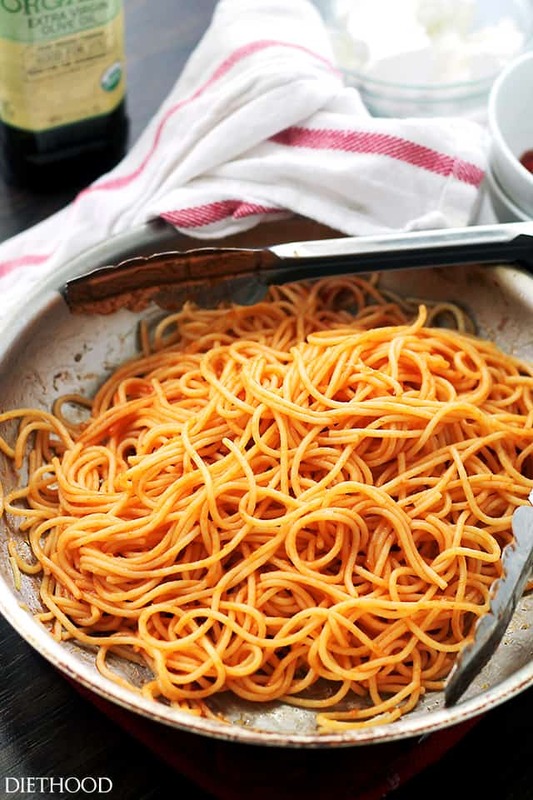 My mom or grandma would cut them in every width and length, depending on what recipe the noodles were meant to be used for, but pasta with ketchup was definitely a favorite. Yet, unlike them, I just reach for the box in the pasta aisle and have din din ready in 30 minutes or less. And my ketchup is store bought, too. The feta, as well. Oh my gosh. You know what? They even made their own feta cheese! Damn! I just realized, those two made everything from scratch! Clearly, that new disease? Lazyitis? It’s real, and it found me. Or is it Facebookitis? Pinterestitis? Instagramitis… Girrrl, I got ’em all! Regardless, we’re not making pasta from scratch, but I do hope that you will reach for the whole grain pasta – less guilt, ya know? And my favorite Organic Extra Virgin Olive Oil by STAR. Nothing better, I promise. Also, organic ketchup is great! I buy mine at Aldi and it is faaantastic! Less sugar and a whole lot more taste. I can eat it on its own. Well, with fries, but let’s pretend. Now that I’ve given you a grocery list, I can only hope that you will go and get all the needed ingredients to make your new favorite meal! 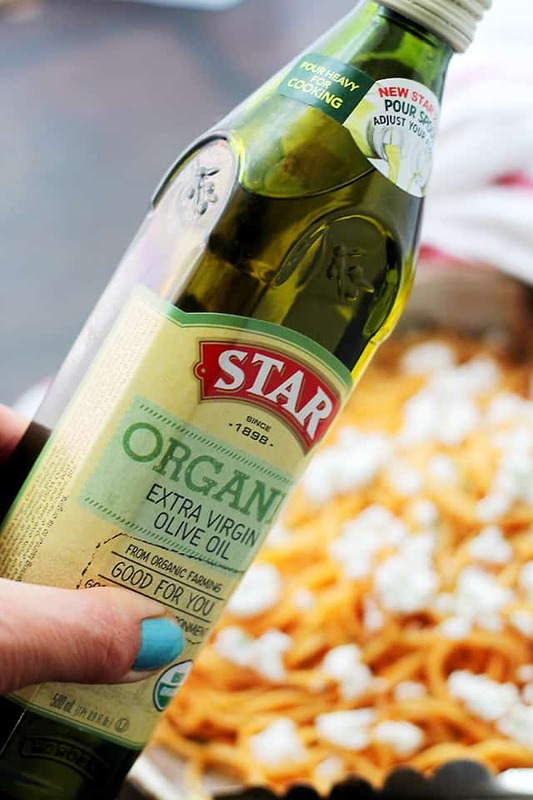 STAR Organic Extra Virgin Olive Oil is available at retailers nationwide including Safeway, Kroger, Vons, Albertsons, Food 4 Less, Save Mart, Target, Walmart, Schnucks, Food Lion, Stater Bros., Raley’s, Smart & Final, Bashas, King Soopers, Vallarta, Jewel, Smith’s, Dierbergs, HEB and Ralphs and online at STAR Fine Foods. Add the garlic and, stirring frequently, cook for 1 minute, or until lightly browned and fragrant. 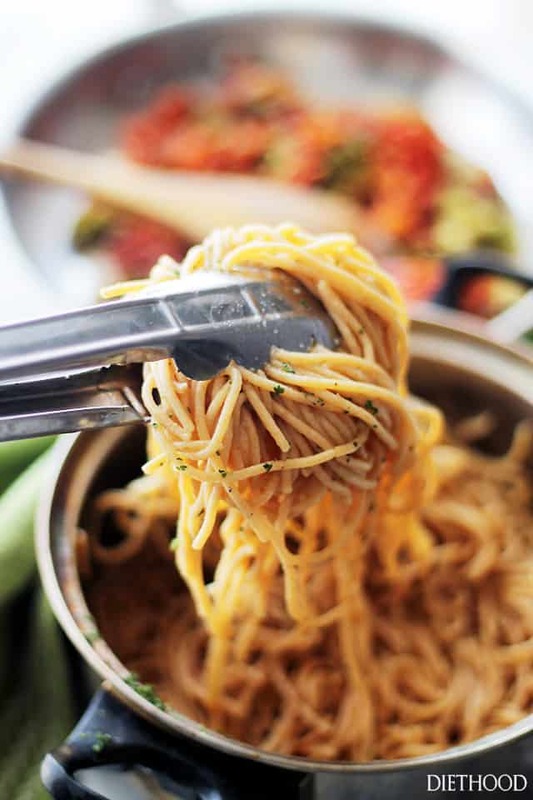 Using tongs, add pasta to the pan and toss and stir until well combined. Add ketchup and stir to combine; continue to cook for 1 minute, or until heated through. I have an ongoing working relationship with STAR FINE FOODS. Thank YOU for supporting the brands that make DIETHOOD possible! All opinions are always 100 % my own! I just stumbled upon your blog. I grew up eating homemade noodles with ketchup too!! It was passed down from my dad’s Russian German side. I had never heard of anybody else who eats it! I am so intrigued by this dish! I never would have thought of ketchup and feta together, but I take your word for it that it’s good! One of my BFFS used to eat pasta with ketchup when we were teens but she never convinced me to try it! LOL! But this does look delicious! I have never made my own pasta. This needs to change! Also I would never run away from a recipe that looks this delicious. Who doesn’t love ketchup? What? Ketchup and feta ? You totally have me intrigued! I must make this! Isn’t it crazy how our older generations made everything from scratch?? I wish I was more observant want I was younger to pick up more tips and tricks from them. And I bet the ketchup in this is amazing! Its just like pasta sauce. ha! I would have never thought to put ketchup with pasta BUT my 2 year old is completely obsessed with ketchup so I’ll be making this for her soon! Wow. I wish my mom put ketchup on pasta too. Ketchup on pasta sounds so cool. Such a quick and delicious dinner. Perfect for any day. I absolutely adore this recipe! 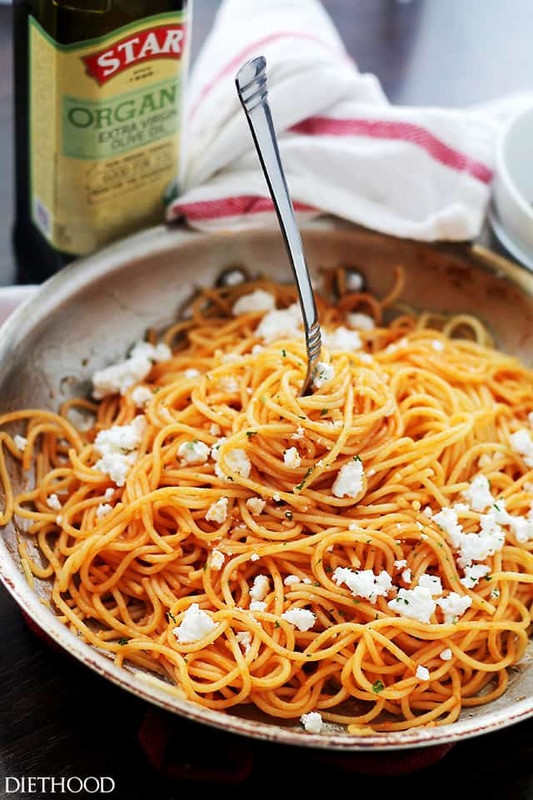 Aside from the feta cheese, we used to do this with leftover pasta and made “fried” spaghetti as a kid – best lunch ever! 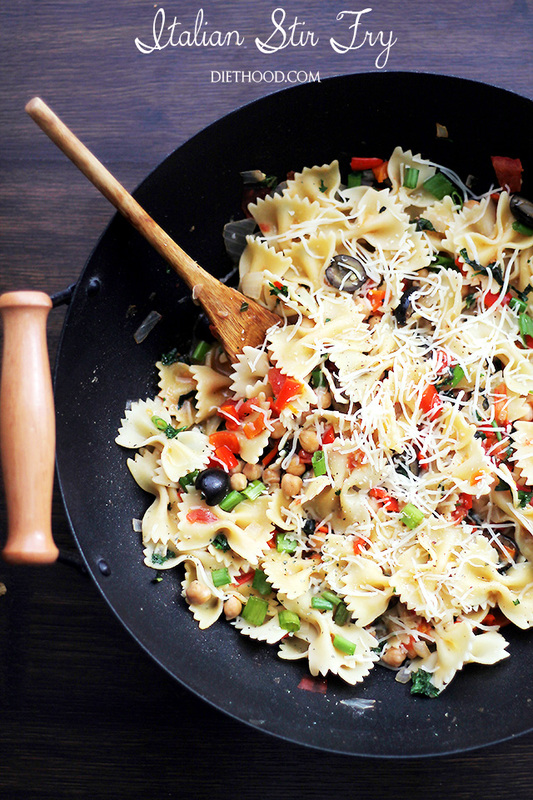 I want a whole PILE of this gorgeous pasta!! And I have THREE packages of feta that have to be used – this looks like the prefect reason! Not even kidding you this was my favourite meal as a kid BUT it was totally called Persian spaghetti. or Es-pa-ghe-ti ba ket-chup. (Iranian accent). Gah, this needs to go viral it’s my favourite!! oh and Persian Feta. (which apparently the Bulgarians stole from).